Does Hope sing Solo or is she just the outspoken member of the band? For those who witnessed the US Women’s National Team (USWNT for the sake of this blog) triumph at Wembley, you will have seen a group of players fighting for each other and overcoming a dogged, talented and entertaining Japan team in front of 80,000 people. 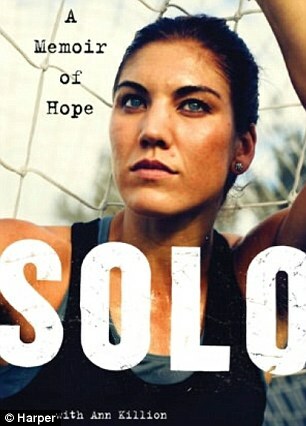 But just five days after the 18 squad members and four alternates were presented with their gold medals, keeper Hope Solo released a book that reveals all about her upbringing, her rise to fame, and a troubled period with the USWNT that saw her ostracised by other members of the squad. Solo: A Memoir of Hope, is an autobiographical account of a young girl growing up in the Richland area of Washington, just outside Seattle, who dreams of becoming a professional ‘soccer’ player. I will warn those that haven’t read the book yet that there could be a couple of spoilers, so stop reading now if you plan to read the book yourself. Solo, an undoubted talent who has certainly played her part in raising the profile of the game, speaks openly about the troubled relationship she has with members of her family, the close bond she had with her father despite his various wrongdoings, and the trials and tribulations she has encountered as a member of the USWNT. As a former journalist myself, I’d be interested to hear the side of players and staff that are named and shamed in the book, but Solo’s account highlights a small group of players that appeared to possess power that you would only expect the staff to have. Its one thing to express an opinion, its another to influence a coach’s decision, force a player out of team meetings/meals, and even see them prevented from suiting up in their nation’s colours. There is no doubt that Solo’s ‘outspoken’ views will have ruffled a few feathers, and she admits that she has an attitude adopted from her father, which sees her probably speak out when it would be more sensible to sit on her hands and keep quiet. Her interview lamenting coach Greg Ryan for dropping her after the US’s 4-0 loss to Brazil at the 2007 World Cup was the start of a difficult period for Solo, which would see her put up in front of the entire squad and asked to explain her actions. In scenes that some could perceive to border on bullying, Solo faced an uphill struggle to win back the trust of a squad, who in my opinion, over reacted with behavior that you’d associate with children. In my view, the Americans had just taken a hammering from Marta and her Brazil colleagues, and focusing their attention on Solo’s interview was a way of turning distracting the media, and themselves, from their tournament elimination. On the flip side, Solo has a habit of making comments and portraying behavior that could be misconstrued as arrogant or dismissive of her teammates. There is definitely an outspoken mentality that has seen her fined, suspended and kicked off of teams, but this is what seems to have made her so popular in the US, and even in other countries around the world. Solo admits that she isn’t one for big crowds and much prefers to avoid the big parties, and this appears to carry over into the national team. She regularly talks of sitting on the team bus with her headphones on, which would indicate little interaction with her teammates, while there were also clear tensions with some of the older players. There was also an incident during the recent London Olympics that saw Solo criticise World Cup 99 winner Brandi Chastain on Twitter, who made comments about the defending of Rachel Buehler after one of the fixtures during the games. While this showed loyalty to Buehler, some internet forums stated Solo had disrespected the ‘legacy’ that players such as Mia Hamm, Kristine Lilly and Chastain had built following their World Cup win 13 years ago. Despite this, its doubtful you’ll hear Solo apologise or retract her comments, and while the team of 13 years ago was an undoubted powerhouse with some household names, surely it is time to move on and embrace a team that recently became Olympic gold medalists? To me, answering my question in the title, Solo definitely has characteristics of the front man of a band. She enjoys being part of a team and sharing her success (a moment with coach Pia Sundhage in the book will support this), while she speaks up for her teammates, even if it does get her into trouble at times. Some might perceive her to be a solo artist – arrogant, someone who isolates herself from big group situations, and an individual who will occasionally make comments that will anger others. I would highly recommend having a read of Solo’s book, if I haven’t ruined it for you already, and definitely let me know your views, either below or on twitter (@kierstheivam).